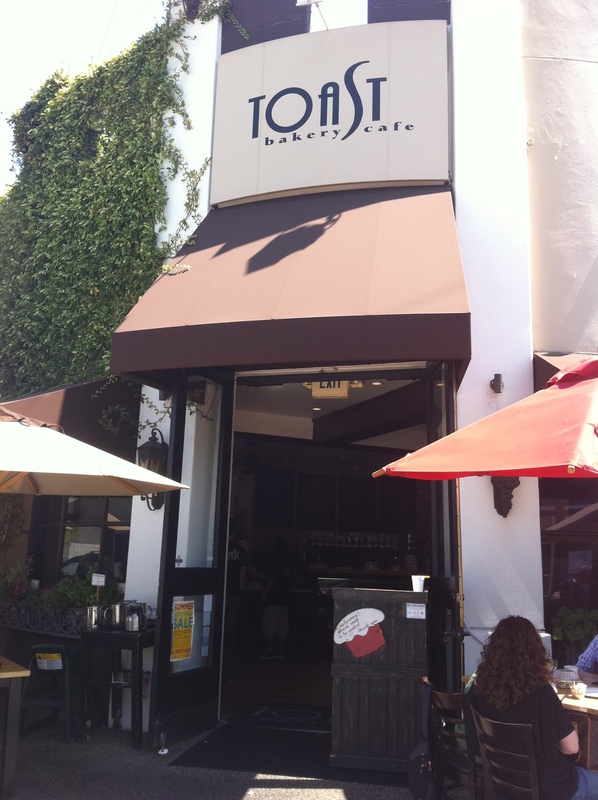 While watching the popular television show, Entourage, the other evening, a scene took place in front of Toast Bakery Café. Every time I drive by Toast, there’s always a line of people waiting outside for a table. It doesn’t matter what time of the day it is from 7:30 a.m. to 10 p.m., people are always hanging around Toast. Your best chance to secure a table outside is during a weekday or for dinner. I’ve heard they serve a hearty breakfast, so last week I decided to give it a try. Located on the corner of W. Third St., and Harper, it’s a friendly place where neighbors come to enjoy the generous portions of good food. For better “people watching”, try to secure a table along the more bustling Third St.
Their omelets and scrambles come with potatoes or fresh fruit and toast or tortillas. I ordered The Favorite with goat cheese, spinach, sundried tomatoes, avocado, mushrooms and basil scrambled with eggs and corn tortillas. I ordered the fruit, leaning towards a healthier option. My server looked at me and said “Are you sure?” with a little smile. When I asked him if the potatoes are worth the extra calories and fat, he said “Of course they are, most of our customers order them.” So, I succumbed to temptation. Read more of my review http://parklabreanewsbeverlypress.com/news/2011/08/toast-bakery-cafe/, courtesy of the Beverly Press, published on 8/18/11.